SANANA, LELEMUKU.COM - The 2018 Maksaira Festival which opened on Saturday (14/04) became an opportunity for residents and government of Sula Islands District, North Maluku Province to record the achievement score at Museum Rekor Dunia Indonesia (Muri). MURI successfully validated the Maksaira Festival in the record of Fish Grouper Fishing Competition by most anglers with the number reached 3,000 more people. 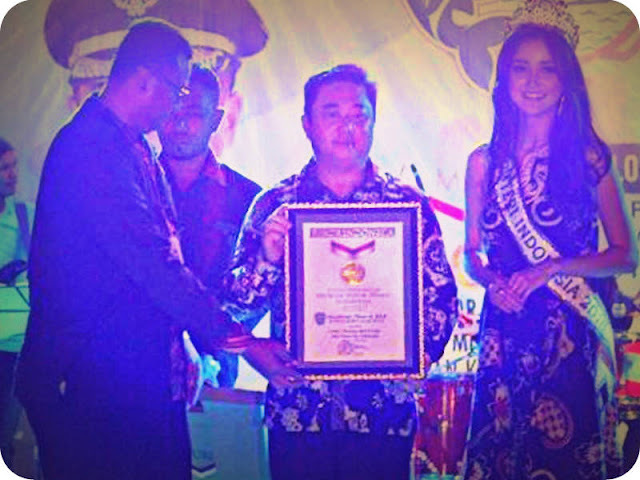 This award was presented directly by MURI representative, Awan Rahargo, to Sula Hendrata Thes Islands Regent. The second edition of Maksaira Festival held on Sunday, April 15, 2018, at Pengeringan Beach, Sanana, has become a venue for fishery promotion to tourism potential in the District of Sula Islands. Regent Hendrata said, in addition to the potential of marine and fisheries, Sula Islands have a panorama under the sea is still unique and natural. "Maksaira itself is interpreted as a meeting of traditional leaders Maksaira contains the meaning of regional philosophy such as mutual cooperation for unity," said Regent Hendrata in his speech before releasing the angler to the sea to catch grouper fish that became one of the fishery commodities of Sula Islands. Fishing, says Hendrata, is one of the most common cultures in the Sula Islands. Hendrata expects this agenda to be sustainable every year to continue to introduce culture, local wisdom, as well as Sula's natural beauty to all over Indonesia, even the international world. Sula Island District Government provides prizes of three boat fiber bodies and three boat engines worth a total of Rp 150-Rp 200 million. This prize is given to the angler who gets the most results. The anglers catch the grouper with the traditional tools and ships they have. There are 713 sampan, 125 ketinting, 79 long boats, 248 fiber boats, and 12 ships used 3,041 registered participants from 47 villages. Thousands of these boats lined the 20-kilometer kilometer from Wai Ipa Beach to Bajo Village. Maksaira herself, continued Hendrata, in the Sula regional language has gotong royong meaning. Previously, the activity in the Maksaira Festival itself was not fishing but burning fish along the 15 kilometers. "This year wants to make something different. So it's impossible to burn the fish again, "he said. Fishing, said Hendrata, is one of the most common cultures performed by people in the Sula Islands. Hendrata berahrap this agenda is expected to continue every year to be able to introduce Sula culture to all over Indonesia and even abroad. In addition to the fishing competition, the Maksaira Festival is enlivened with local products such as handicrafts, snacks, typical Sula honey, and various innovations SKPD Kabupaten Sula Islands. The public was also entertained by the artist of the Capital City, such as Selfi Nafilah (KDI), Trio Wrigala, and local artist who was loved, Brigadier Fahrin Ilham Silayar.